The Civil War monument stands in a small triangular park between Monroe and Fulton and bordered on the west by Division Ave. Today the Monroe St. side has been converted to a walking area. A Union soldier stands at the top with his rifle and "Petersburg" is written at his feet. Cherubs on each side are part of a fountain and the water flows into a pool at the base. The plaque states that it was erected in 1885 to honor the fallen soldiers from Kent County. In the background are stores along upper Monroe Ave. where shoppers can be seen strolling and resting on benches. At the far left stands a horse and buggy. Title from collection. The glass negative has been broken in several places and the lower left corner is missing. 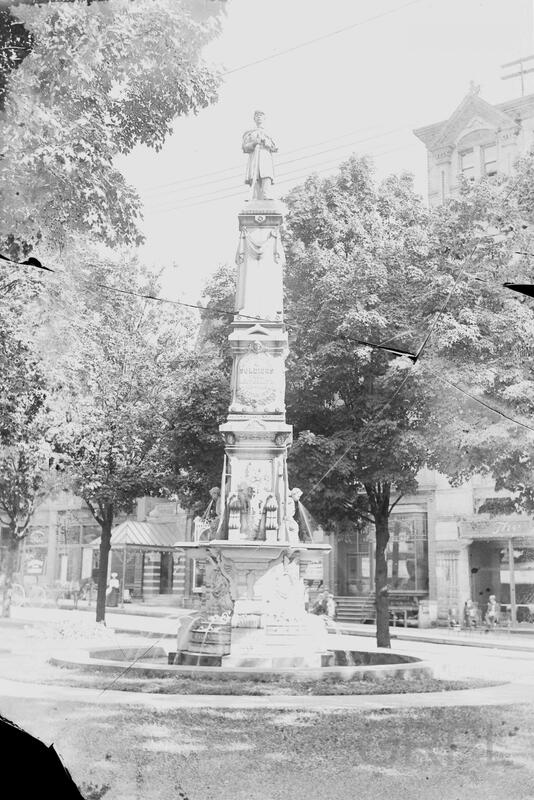 In 2003 the restored monument was unveiled due to help from many local groups, corporations, companies, and municipal agencies who made sizable donations. Students were also involved; Godwin Heights students raised $8,000.00. The project was spear-headed by The Sons of Union Veterans of The Civil War. The GR Civil War Round Table and Bruce and Marcia Butgereit, who received the Baxter award in 2004 for their work, took leading rolls in the project.